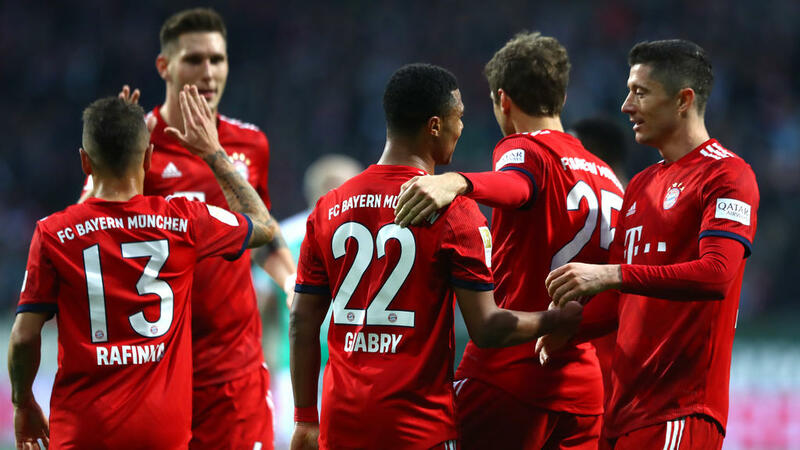 Bayern Munich earned their first Bundesliga win for a month as Serge Gnabry scored twice in Saturday's 2-1 win at Werder Bremen, but the defending champions remained nine points behind leaders Borussia Dortmund. Bayern's victory lifted them two places in the table to third, but they will drop back to fifth if Eintracht Frankfurt earn a fifth straight win at home to Wolfsburg on Sunday and RB Leipzig beat second-placed Moenchengladbach. Bayern built on their 5-1 midweek thrashing of Benfica in the Champions League, but still lag well behind Dortmund, who also won 2-0 at home against Freiburg. "We know about the situation in the table - every game is important to get the three points and reduce the gap in the table," said Bayern goal-scorer Gnabry. "The victories ensures a good mood and gives us confidence for our next game (against Nuremberg next Saturday). "We didn't give much away - that gives us confidence." The last time Bayern were so far behind in the table was in 2010/11, when Dortmund won the title, and their bid for a seventh straight Bundesliga crown is in danger after only their third win in their last nine league games. Gnabry, who started for Arjen Robben, put Bayern ahead on 20 minutes in Bremen after Joshua Kimmich's chip into the area shortly after the visitors had a penalty appeal turned down. Thomas Mueller then fired wide with the goal at his mercy, but Bayern's defensive frailties returned to haunt them as Bremen equalised 14 minutes later. Centre-back Jerome Boateng was out-leapt by Japan forward Yuya Osako after a pin-point accurate cross as Bremen drew level after midfielder Nuri Sahin had gone close. It was 1-1 at the break, but Bayern grabbed the winner five minutes into the second period when Mueller delayed his pass into the box for Gnabry to deflect the ball into the net. Bremen finished with 10 men when Niklas Moisander was sent off just before the final whistle for a second yellow card. However, there was more good news for Bayern as winger Kingsley Coman came on for his first appearance since tearing ankle ligaments on the opening day of the season in August. Likewise, Thiago Alcantara played the last 10 minutes after a month out with injury. In Dortmund, Paco Alcacer continued his phenomenal scoring run by netting his 10th goal of the season to become the league's top scorer. The Spaniard also equalled the Bundesliga record for most goals by a substitute in a season -- just 13 matches into the 2018/19 campaign -- with his ninth goal off the bench in his eighth league game. The ex-Barcelona forward has so far averaged a goal for Dortmund every 28 minutes. Dortmund went ahead when England teenager Jadon Sancho was brought down and Marco Reus hit his penalty attempt into the middle of the goal five minutes before half-time. Alcacer came on in the 70th minute and tapped home a minute into added time after brilliant play by Sancho and Lukasz Piszczek. "It was logical that this would be a tough game for us, as Freiburg picked up a point (against Bayern) in Munich," said Dortmund coach Lucien Favre. "They were very organised and compact, making it hard for us to find the holes, but luckily we were patient." Hertha Berlin picked up their first win since stunning Bayern in September with a 2-0 win at Hanover. Berlin's captain Vedad Ibisevic heading home in the second-half after centre-back Jordan Torunarigha put them ahead in the first-half. Stuttgart moved off bottom place with a 1-0 win over mid-table Augsburg after striker Anastasios Donis scored their first-half winner. In the evening's game, Schalke, who qualified for the last 16 of the Champions League in midweek, moved up three places to 11th with a 1-1 draw at Hoffenheim. Andre Kramaric's penalty for Hoffenheim in the second half was cancelled out by a spot-kcik from Schalke's Nabil Bentaleb 17 minutes from time.